CHAMBLY, QC – Unibroue has announced the release of a new edition of Unibroue 17 Grande Réserve, a former one-off anniversary beer that has now become an annual vintage offering. 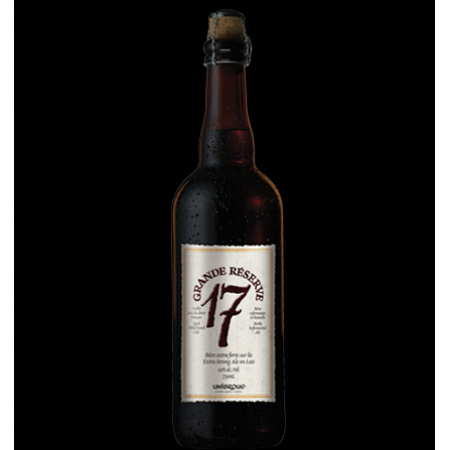 First released under the name Unibroue 17 to mark the brewery’s 17th anniversary in 2007, the beer is a dark Belgian-style ale aged with French oak and bottle refermented. The original edition won a number of international awards, including being chosen World’s Best Dark Ale at the 2010 World Beer Awards, and this success inspired Unibroue to bring it back last year as Unibroue 17 Grande Réserve – the added designation recognizing it’s exceptional aging qualities. The 2012 Vintage of Unibroue 17 will be available soon in select markets in Canada and the U.S.